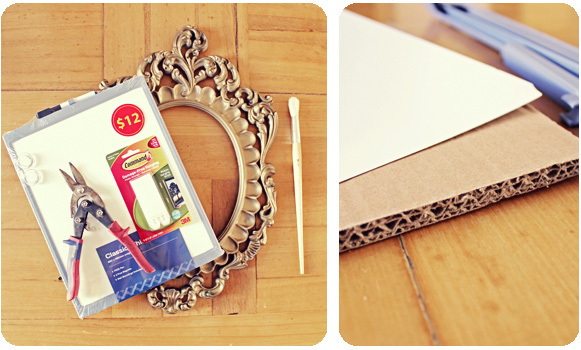 Materials: A frame that you like, a cheap whiteboard, tin snips, masking tape and something to attach it to the wall. I used trusty 3M velcro strips. 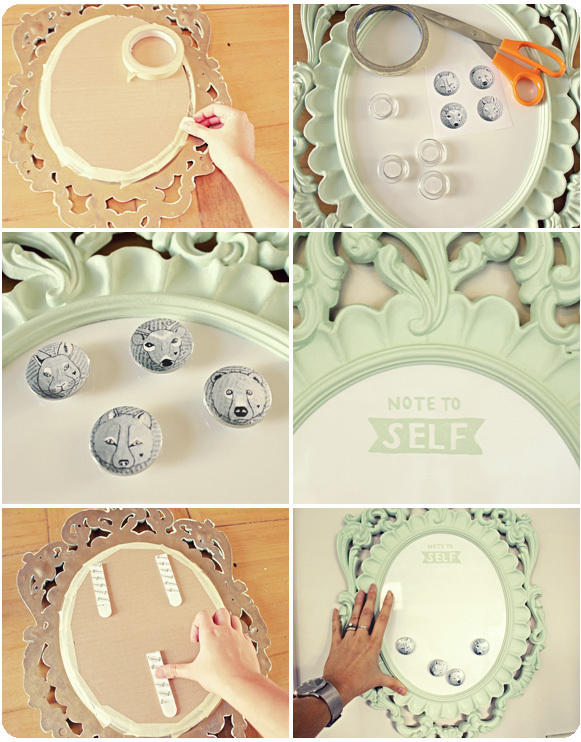 Optional: paint, paintbrush artwork, tape, double sided tape and magnets. 1. Pull apart your whiteboard. It should (some whiteboards may be different) have a thin whiteboard aluminum sheet with a thick cardboard backing. 2. 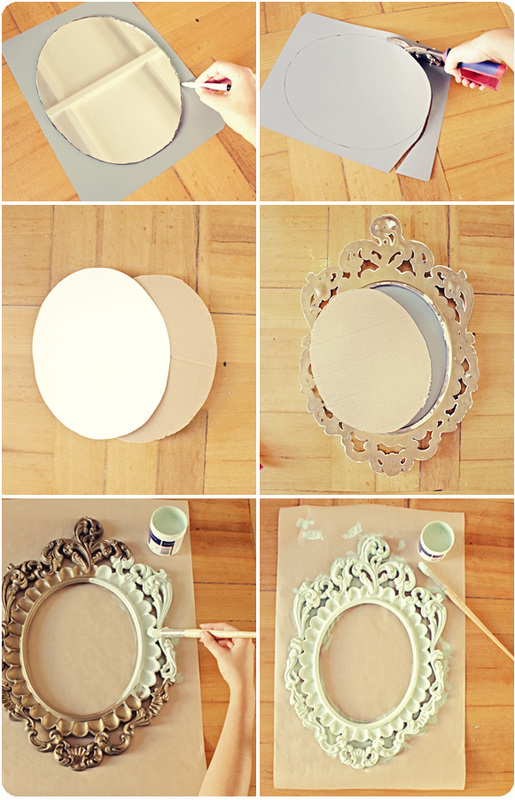 Turn the sheet over and mark out the shape of your frame. My frame used to be a mirror so I traced around that. 3. 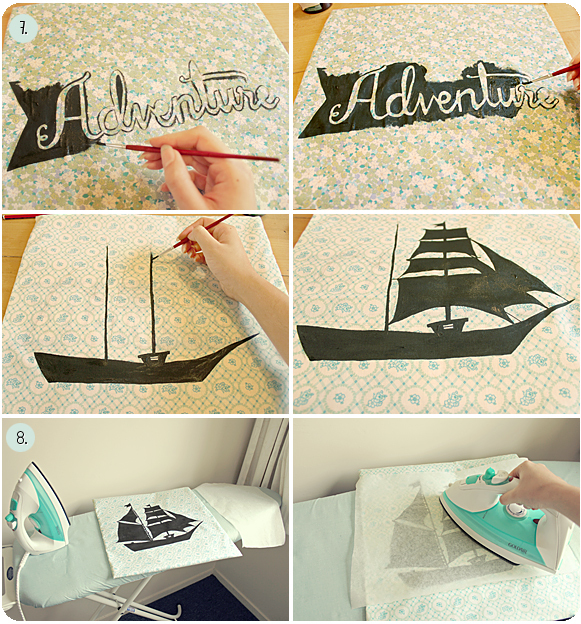 Use the tin snips the cut out the shape. 4. Do the same with the cardboard backing. 5. Make sure it fits snugly in your frame. 6. If you don't like the colour of your frame, paint it. 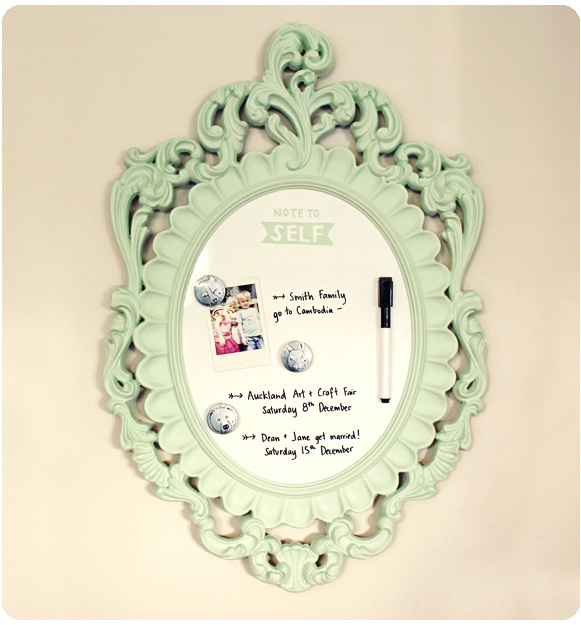 You may or may not have noticed that I have a slight obsession with mint at the moment... So I painted my gold frame mint. 7. Once your paint is dry, put the whiteboard and backing into your frame and secure it. I used masking tape. 8. My little $12 whiteboard came with plain clear magnets and I wanted to make them a bit more special. So I printed out the animal faces that I used on my DIY Christmas Decorations. I put clear tape over top so they would be a little waterproof and double sided tape on the back. Then I stuck them to the magnets. Easy! 9. 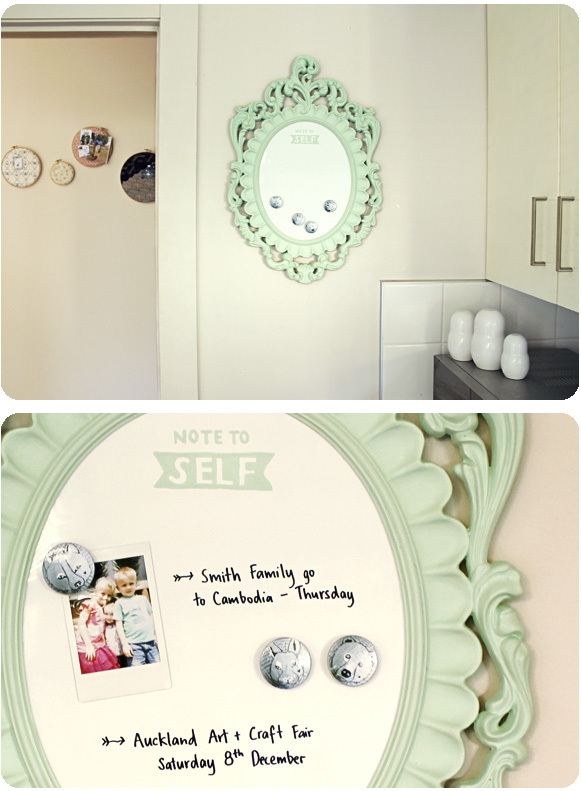 I also painted a little "note to self" up the top in the same colour that I painted the frame. 10. Apply the 3M strips, hooks or string. 11. Fasten it to the wall. 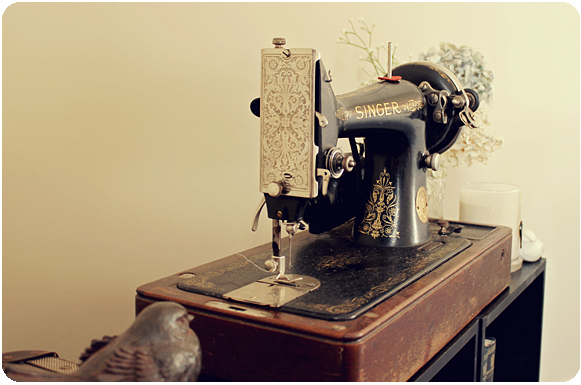 Having an old Singer sewing machine in my lounge has been a good reminder to bust out my 'actual' sewing machine. I am dreaming of the day when I have room to have it set up permanently. But until then, it has to stay stored away in the cupboard... where I sometimes forget about it! I am an extremely AMATEUR sewer. I only know the basics and I just make it up as I go along... I'm in desperate need of a lesson. So these wee pillows are nice and easy. You'll need: A pillow inner, fabric, a sewing machine or needle and thread, pinking shears, pins, cardboard and fabric paint. 1. Place your fabric face-down and put your pillow inner on top. Fold the fabic up to the half way mark on the inner. Fold back an extra 80mm or so of the fabric. 2. Fold the rest of the fabric over the inner. Make sure there is a decent amount of overlap as this is where you get your inner in and out of the pillow case. Fold back the excess fabric like you did in step one. 3. 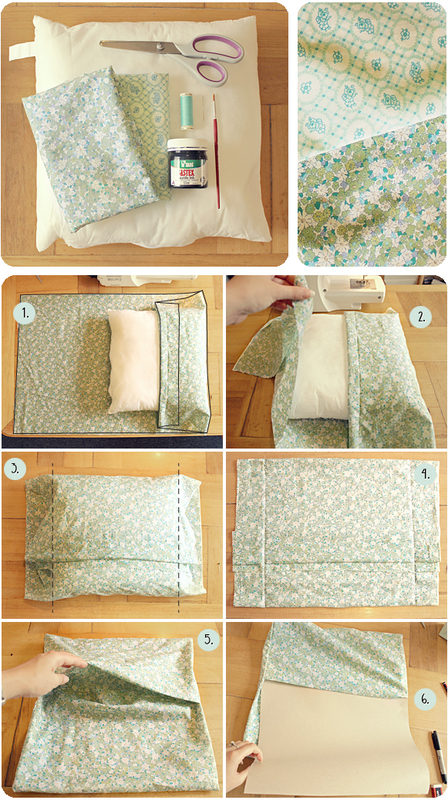 Pin the fabric so that the inner is nice and snug within the pillow case. Take out the inner. 4. Sew (or stitch) where you have pinned. Once done it will look like the above picture. Trim the excess. 5. Fold the pillow case inside out. Volia! You now have a pillow case... But now for the fun part! 6. Slide some cardboard into your pillow case. This is so the fabric paint doesn't leek through to the back of your pillow case. 7. Paint until your heart is content! 8. 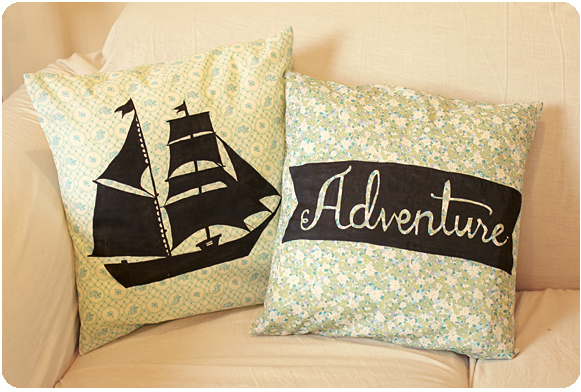 Once the paint is touch dry put a sheet of baking paper over your design and iron the pillow case. Put your pillow inner back in and your done! My wonderful Mother kindly bought me an early Christmas present! 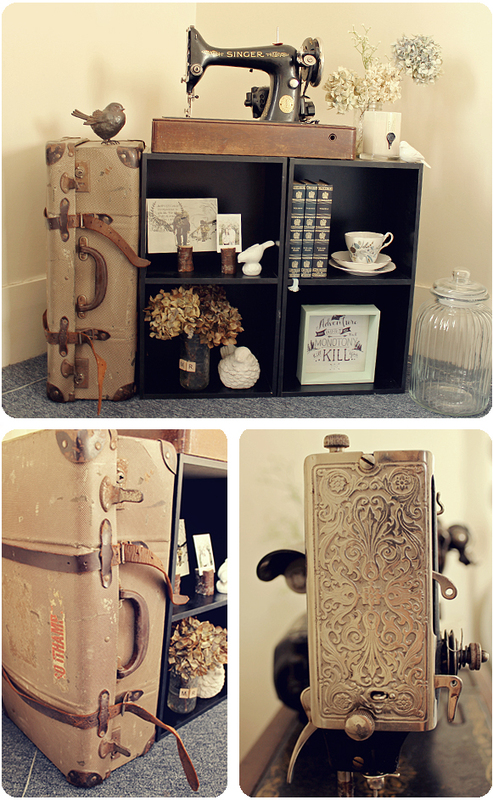 I think these old sewing machines are so beautiful and I've always wanted one. 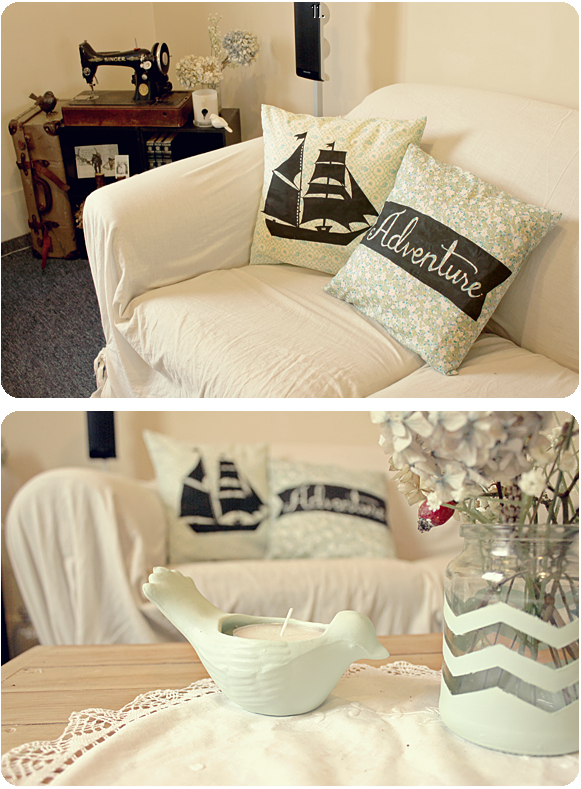 I think it makes a nice edition to our lounge :) Thanks Mum!